Members of six credit unions in Lincoln, Neb., will have another way to meet their need for short- term, low-dollar loans after their CUs joined together to start offering an alternative to payday loans offered elsewhere. 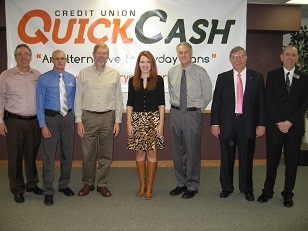 From left, Jerry Barnett, president/CEO, LincOne FCU; Kenn Miller, president/CEO, MembersOwn CU; Bob Torell, president/CEO, University of Nebraska FCU; State Sen. Amanda McGill; Chris Nielsen, president/CEO, Nebraska State Employees CU; Ken Bradshaw, president/CEO, Liberty First CU, and Dale Springer, president/CEO, Peoples Choice FCU. Members of six credit unions in Lincoln, Neb., will have another way to meet their need for short- term, low-dollar loans after their CUs joined together to start offering an alternative to more expensive payday loans offered elsewhere.